VersApak is designed to crush within1 yard box, drum, and overpak compactor (3 Units in 1) and are equipped with interchangeable platens and a unique dual force ram system to enable multiple applications. A single control switch delivers 20,000 lb. 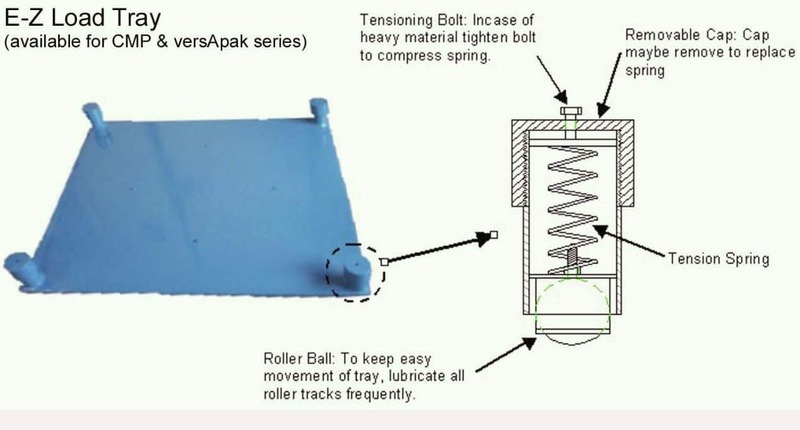 compacting force within cubic yard/meter boxes without damaging container & pallet. A drum setting delivers 40K-90Klb. to compact within drums or crush them. The VersApak features a unique dual force ram system to apply 20,000 pounds of force to compact waste material in DOT approved cubic yard (meter) boxes, and a 40,000 or 90,000 pounds setting to compact or crush drums. The exclusive 10 inch Hydraulic RAM system prevents side loads, while the E-Z Load Tray allows an operator to easily move heavy filled drums in and out the compaction chamber. A complete family of compactors and drum and pail crusher designs offer robust and affordable systems for all applications. All models are available with a variety of power options including electric and pneumatic suitable for Class 1, Division 1 environments. By simply changing an easily removable platen, these systems are designed to compact waste within 55 or 90 gallon drums, or serve as a drum crusher. Custom designs offer solutions to hazardous locations and low level radiation applications.